The aim of software testing is to ensure good quality software. Good quality software means it has less defects or issues, it works well, and does what it needs to do. However, the results of a recently published survey of 1,600 IT professionals from 32 countries revealed some troubling statistics. Although 85 percent stated that products related to the Internet of Things are included in their business operations, 58 percent of this group have no test strategy for IoT products. Among executives responsible for quality assurance and testing, 65 percent considered security enhancements to be a top priority, while only 35 percent felt that better alignment to the business was a priority. Producing higher quality software solutions and enhancing the customer experience were ranked as top priorities by 44 percent and 42 percent respectively. Furthermore, the portion of IT budgets earmarked for quality assurance and testing decreased to 31 percent from 35 percent in 2015. Among the respondents to the aforementioned survey, 44 percent expressed a reluctance to include members of the testing team during the initial planning stage. Due to the ever-increasing emphasis on agile development and reducing the time to deployment, some of the respondents stated that including testing teams early in the process could lengthen the time it takes to go from planning to release. In many organizations, walls have been built between the testing, development and quality assurance teams and between the IT department and the rest of the business. The job of QA professionals is often hampered by a number of myths surrounding their duties. In some businesses, the terms "testing" and "quality assurance" are used interchangeably. Although they are interrelated, they are not synonymous. The perception is that a product passing quality assurance has been tested thoroughly or that a product passing the test procedures meets the requirements for quality. There is no need to involve QA until the end of the development cycle. In reality, the best quality assurance encompasses the entire process from gathering requirements to support and maintenance. In addition, it is always more economical to fix issues while the code is still fresh in the developer's mind and before bugs can affect additional functionality. Testing is not difficult as all tests can be automated. The most effective method often involves both manual and automated tests. Software can successfully pass automated tests and then fail when subjected to the unpredictability of human testers. Quality assurance increases costs. Although it is true that QA takes a portion of the budget, skimping on testing and quality assurance is a case of "penny wise and dollar foolish." Without effective QA, a project can deteriorate into endless bug-fixing that becomes much more expensive than catching and correcting problems earlier. Furthermore, the company's reputation could suffer if users lose confidence in the product. 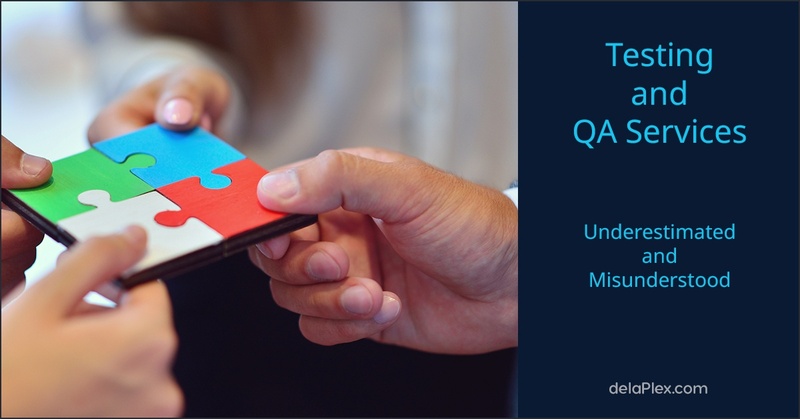 In many organizations, quality assurance professionals continue to be undervalued and underestimated, primarily by those who are unfamiliar with the role that QA and testing teams play in the success of a project. By extension, many of these individuals underestimate the importance and benefits of effective testing and quality assurance. A good QA professional and the work that he or she performs adds value to the project — even if it is impossible to assign a specific dollar amount to the contributions made by the QA and testing teams. Reduce Staffing Costs. While development resources are expensive enough to maintain in-house, an outsourced QA team can help your business better allocate funds toward development, depending upon priorities. Since, in a limited funding situation, most companies are going to prioritize actually producing a product (development) over testing it, QA often gets the short end of the stick. Outsourcing can help bridge that gap. Test Results Overnight. Many offshore QA teams are up to 12 hours out of phase with your time zone, which means that your development team can submit code for testing at the end of one business day, and arrive in the morning to find test results waiting. Free Up Development Resources to Iterate. Inspiration strikes at all hours of the night and day in the software developer's mind. That solution might come on the morning commute, in the shower, or any other random time. Knowing that a new fix or feature can be handed off to testing, while the developer keeps moving on with her process, can really help build and keep momentum. Objectivity. It's very easy to lose sight of the forest for the trees when dealing with our own creations, which is why development and QA teams have typically been kept separate and in somewhat adversarial roles. An outsourced testing team can provide the ultimate in objectivity and "fresh eyes" on a project. Ideally, we should get someone else to check our work because another person is more likely to spot the flaws. Domain Expertise. Outsourced QA teams typically have exposure to a wide variety of domains making it easy to assemble a pool of industry savvy resources for testing your current project. This inherent expertise substantially reduces the cost associated with product training and more quickly provides accurate testing results. At delaPlex Software, we understand the importance of effective testing and quality assurance. We combine our domain knowledge, solution expertise and technical skills to help you deliver software faster, with quality and predictability, while reducing project costs. The team of QA professionals at delaPlex are certified by the International Software Testing Qualifications Board (ISTQB) and trained in the latest testing methodologies and tools and offer a wide variety of services. Contact us today to learn more.